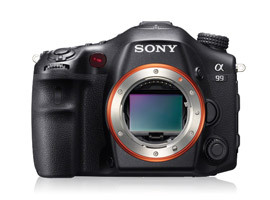 Best lenses for your Sony SLT Alpha 99: 22 wide-angle, standard and telephoto models analyzed! With the introduction of SLT models featuring the novel ‘translucent’ mirror technology, Sony were the first to break with the traditional reflex mirror and optical pentaprism found in rival SLR systems. As well as adopting an electronic viewfinder, the novel system utilizes a semi-transparent mirror (or “Translucent” mirror, as Sony calls it), which remains in the lens’ light path. Fixed “pellicle’ mirrors aren’t new of course, the partially silvered mirror allows for conventional viewfinder based phase-detection AF and metering systems to be retained. In fact, this system allows for full-time continuous phase-detection AF (PDAF) during live view and video capture. As successor to the A900 DSLR, the SLT-A99 stands-out as the first full-frame model from the firm to move to an electronic viewfinder and the first to supplement the viewfinder AF system with a second 102-point PDAF-assist sensor array overlaying the 24.3-MPix CMOS sensor. As well as the option to capture 14-bit RAW files, the camera also adopts what the firm describes as ‘newly developed multi-segment OLPF’ designed to enhance the sensor’s resolving power. With a DxOMark Score of 33 points, the top-performing Sony A-mount lens in our database is the $1426 Sony made, Zeiss designed Planar T* 85mm f/1.4 ZA. Sony’s 50mm f/1.4 or the older Konica Minolta AF 50mm f/1.4 represents good value and score highly, while the Sony 100mm f/2.8 Macro at $679 or perhaps the Sigma equivalent could be pressed into service as a portrait lens if the shorter, faster Zeiss is out of reach. Of those tested, the best performing wide-angle lenses are the Zeiss Distagon T* 2/24 and the Sony 35mm f/1.4G, achieving 25 and 24 points, respectively, on our DxOMark Score, though the best value is the modest little Sony 28mm f/2.8 $270 with a DxOMark score of 17 points. With a DxOMark Score of 22 points, the Sony made, Zeiss designed Sony Vario-Sonnar T* 24-70mm F2.8 ZA SSM is the highest performing zoom in the range, followed closely by the Sony 70-200mm f/2.8G and Tamron SP 24-70mm f/2.8 Di USD sharing second place with 21 points. At $499, best value of all the standard zooms analysed was the Tamron SP AF 28-75mm f/2.8 XR Di LD Aspherical [IF]. Although it lacks the ultrasonic type motor of the $1299 Tamron SP 24-70mm F/2.8 Di USD Sony version it achieves a DxOMark Score of 20 points, just 1 point less than the new model. It’s also worth noting that neither of these lenses (nor in fact any A-mount lens) features stabilisation as the SLT cameras adopt a built-in stabilised sensor platform. As for telephoto zooms, the new Sony 70-400mm F4-5.6 G SSM II performs well but the model that really stands out is Sony 70-300mm F4.5-5.6 G SSM. If you can do without the extra reach at $800, it’s some $1,400 less and is nearly as good optically. As a part of the imaging chain, the DxOMark score reflects the sum of the components (sensor, filter pack and lens and in this instance, the semi-transparent mirror) and how each interacts. Although the Sony made 24-MPix sensor is similar to that found in the rival Nikon D600, it’s not identical, and, for one, is unlikely to share the multi-segment OLPF of the Alpha 99. Be that as it may, while it’s still not a surprise to see the same familiar focal lengths (and variants of the same model in some cases) as the top-performing lenses, the Sony SLT-A99 doesn’t quite achieve the same high-levels of sharpness as either the Nikon D600 or even the Canon EOS 5D Mk III. For all that, the build, camera specification and handling of the SLT-A99 is, in many ways, superior to the Nikon D600 (with the exception of the AF system perhaps), and when matched with carefully selected lenses is capable of very high image quality and, at the same time, offers a very fulfilling user experience. If you have a favourite lens for you’re Sony SLT-A99, please leave a comment below, stating what lens it is and what you like about it.